As offices grow in complexity, so does the paperwork. POE can help manage documents with document management solutions. POE carries both the hardware such as dedicated scanners and document management software to help convert stacks of paper to computer data. This not only reduces the need for rows of file cabinets, but also makes documents searchable by computer rather than cutting into workers’ productivity. Once in digital form, your documents can be converted to PDF, Microsoft Word or Microsoft Excel formats. But as with physical files, organizing digital files can be complex. Pacific Office Equipment has the tools and know-how to help manage your digital documents. Pacific Office Equipment also offers data backup and recovery tools, keeping your valuable documentation safe and easily recoverable in event of a disaster. M-Files is a Content Management System that uses a unique metadata-driven approach. This organizes your data based on keywords; on what the data is rather than where it is. M-Files has advanced workflow and collaboration controls. Users “check out” data, preventing other users from overwriting the same document. 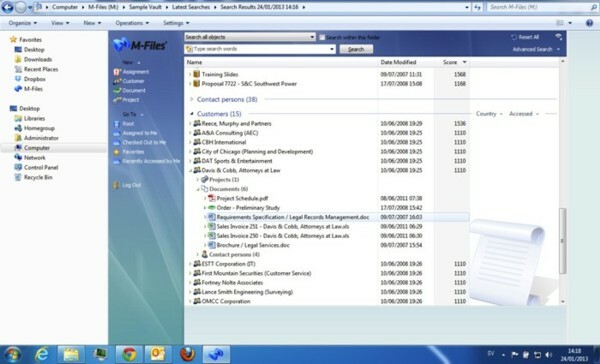 M-Files supports a variety of files and formats: scanned files, digital files, photos, email and more. It works seamlessly with Windows, Microsoft Office apps and most mobile devices. Your files are safely stored in the cloud, on-site or in a hybrid environment. M-Files is an easy and practical solution that helps manufacturing organizations and related businesses fulfill the documentation requirements associated with quality regulations and standards. Standards and regulations such as ISO 9001, FDA 21 CFR Part 11, EU GMP Annex 11, HIPAA and Sarbanes-Oxley, set certain requirements for document management that can be easily met with M-Files. eCopy PaperWorks is the next generation document imaging software that allows office workers to scan, merge, modify and connect documents to electronic workflows and business applications - helping organizations to save time, reduce costs, and increase business results. eCopy ShareScan is the standard in document imaging software for the front office worker. With Canon and eCopy you can turn paperwork into paper that works. Pacific Office Equipment is a proud reseller of the Canon line of digital image solutions. Most Canon machines not only copy, but scan to a computer as well. We have machines in all sizes: small all in one printers, small to large copiers, dedicated scanning units. Some of the Canon Advance line even has digital storage for files, putting your digital paperwork in one convenient location. With larger scan jobs, POE recommends dedicated Canon scanners combined with document management software, converting large stacks of paper to computer files quickly and efficiently. Storage is another advantage to digital files. Cabinets full of paper can be replaced with a single hard drive. The data can be stored on a computer server, an external hard drive, a Canon IR Advance copier or in the cloud. POE sells computer equipment, including computers and servers. We also have a technical team to set up an office network, and maintain it when running. Pacific Office Equipment sells a range of storage backup solutions, including external hard drives and flash “thumb drives”. As a Canon reseller, Pacific Office Equipment is pleased to stock the Canon ImageRunner Advance line, with advanced scanning and storage capabilities. Pacific Office Equipment now offers online data backup solutions. Your important information is backed up nightly to our redundant, offsite storages. In the event of a disaster at your home or office, you can rest easy knowing your data is safe.